What do you do when there’s a storm ravaging the land? One online contact of mine thought of appeasing deities. “[So] far praying to Neptune is working. Is there a Pasig River Nymph I can offer some food or something to, so that she won’t feel the need to overflow and drown the neighborhood?” That question from ChaosGhost made me curious, in a number of ways. I have heard of national hero and poet Francisco Balagtas mention that Laguna de Bay has nymphs in one of his poems, which I still could not find. But I have yet to come across anything that says that Pasig River has even one nymph. Does Pasig River have any nymphs at all? Googled a bit and I came across a poem by national hero Jose Rizal. It is entitled “A Orillas del Pasig” or “By the Banks of the Pasig River”. By the side of the quite underneath the leafy bamboo shade. Where I alone your black eyes shall so delightfully contemplate. A good number of sites claim that it is about a nymph. No offense to the national hero or anyone but – personally – I don’t read anything about a nymph. There’s love, maybe lust, seduction, and an invitation for a delightful boat ride but nothing outright says river deity. Looked for more results and found a short tale. I have no way to verify its author or date. It’s also the only piece of supposed folklore I’ve found. If this is an actual legend, my guess is this is the tale that inspired Filipino composer Nicanor Abelardo to pen the poem “Mutya ng Pasig” or “Nymph of the Pasig River”. She’s the Maiden of Pasig. This poem is a kumintang, which is musical poem. It is meant to be sung. But while it is usually sung by a soloist, there are dual roles to play because the poem has two speakers: the narrator and the nymph. Another interesting note is how the word paraluman is translated. Coming from a piece of literature, it could be translated to a number of things, from “muse” to “princess”, even “goddess”. From the written words of Abelardo, more inspiration sprung and this time it conceived a painting. Or so the story goes. 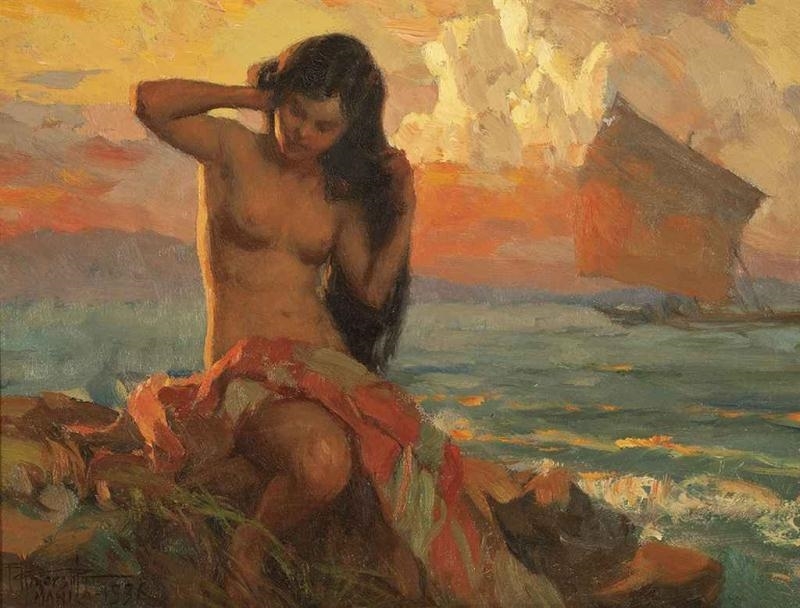 According to one account, the poem moved national artist Fernando Amorsolo to create the artwork known as “Nymph of the Pasig River” (1936). I don’t have a good explanation as to why they’re practically unknown even to us Filipinos. Personally, I think it would be great if there was a collection of local literature dedicated to deities. That would expand the collective mythology to a greater degree. Speaking as a Sensitive, I can say that yes there is/are nymph/s in the Pasig River, as with most bodies of water like the Marikina River. It is no different from some of our famous land forms, like Mt. Makiling. I can even further state that some areas of the Pasig and Marikina rivers contain what can be called as “portals” (similar to Mt. Banahaw). Hmn… You know what, this topic is actually making me think about natural land/water formations and mysticism inspired/related to nature. Possibly a new blog entry in the future, maybe. There are?! That is cool–at least, I think so. Makes me wonder if Balagtas, Abelardo, and other certain poets possess sensitivities like yours. I sure don’t so I won’t be able to make those connections but it would be great to actually see Philippine mythology expand and be as detailed as its Greek, Egyptian, and Japanese counterparts.